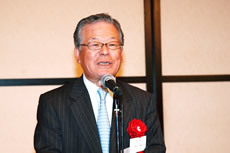 Celebration of the 32 scholarship recipients newly selected in the 2009 Akimoto Tatsunoko International Scholarship Program, as well as 3 who have received additional one-year extension of scholarship, by the officials and screening committee members of the Foundation, scholarship fund contributors and supporters. 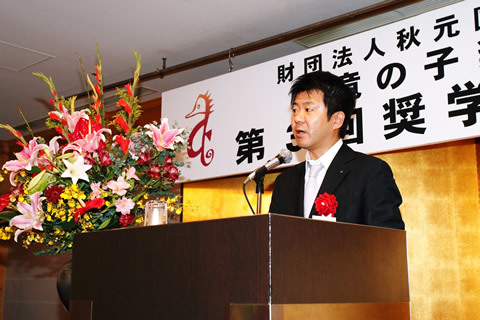 I am pleased to have this opportunity to speak on behalf of the Tatsunoko Foundation at the 3rd Scholarship Award Ceremony. I would also like to thank all of you who are here, including the representatives of the Foundation, contributors and honored guests, for coming to this special event. And, I would like to extend my warmest congratulations to the students who have been chosen Akimoto Tatsunoko scholarship recipients. We are extremely happy and extend our warmest welcome to our Foundation. In March this year and here at Keio Plaza Hotel, there have been a graduation ceremony for our scholarship recipients, who had completed their 2-year scholarship assistance programs and where to start on their own respective journeys in life. Representing the graduates, Ms. Azhani Binti Ismael, a student from Malaysia who studied at Tokyo Institute of Technology, gave a speech. She said, recalling an episode during the program, like this. "The Foundation's exchange meetings were all wonderful. However, the most memorable was the climb up Mount Fuji. We were able to reach the top by helping each other and without anyone falling behind. During the hike, there were other students in the program who helped me with the heavy luggage I was carrying, offering me jacket because I could not stand the cold and sharing lunch with me, because of the diet restrictions I have under my religion. Through these experiences, I was able to feel the warmth of these friends. I am very happy to have been able to have such wonderful friendships, which I will treasure all my life." What I would like you to know is that the Foundation is hoping that the scholarship will not only provide a sense of security to continue pursuing studies and lead to all of you working in your respective specialized areas in the future. As recounted in Ms. Azhani's episode, we are hoping that all of you, having met each other in the same scholarship program, will help each other and nurture friendships, with a sense of humility and effort to understand each other and to continue to be in contact with each other in the future. We are hoping that this will foster international understanding without being restricted by nationality or ethnicity. Today, the world faces countless issues and problems in both society and the environment. I am hoping that you develop the dream to work toward resolving such global issues. Of course, this may be too huge and too difficult a dream. The strength of an individual may be small, but with each of you sharing a sense of fellowship and working together as one, I believe it is not an impossible dream. With all of you dreaming such dreams, you will be able to see "your dream change the world," as the Foundation's slogan says. I sincerely hope that you will continue working in your own respective ways toward finding solutions to various problems and to achieving world peace. Thank you very much for listening, and congratulations. 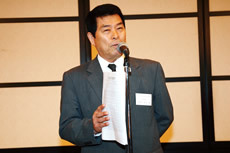 My name is Akira Neki, a member of the Scholarship Screening Committee. 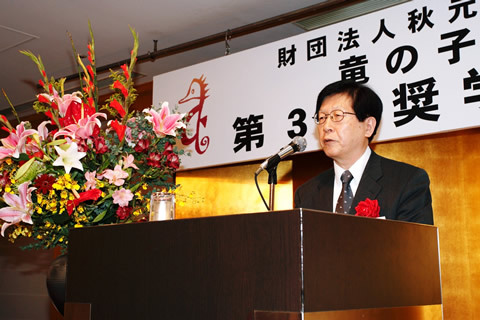 I would like to report on the screening process of the Akimoto Tatsunoko Scholarship Program for 2009, on behalf of the Committee Chairman and Professor Emeritus Masataka Ariyama, who had been unable to attend due to various commitments. The Foundation had decided to select 32 students currently in undergraduate and graduate programs for 2009 and requested recommendations from universities in Japan. We ultimately received 44 recommendations from 22 universities. The Scholarship Screening Committee has established screening standards, under which it examined into each candidate's academic performance, financial status, objective of study in Japan and other factors, and selected 32 people here as recipients of the scholarship. 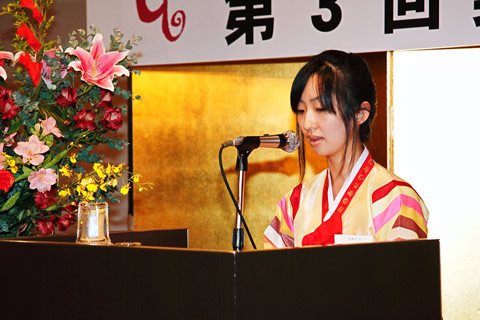 Additionally, 3 of the First Akimoto Tatsunoko International Scholarship recipients had been recognized for their outstanding academic performance, active participation in exchange meetings and contribution to the Foundation, and were allowed to re-apply for the fund. After careful scrutiny, the Committee approved the extension of the scholarship for these 3 students for another year. 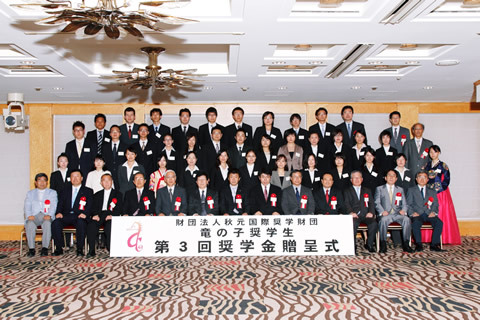 Therefore, the 35 here have been chosen the recipients of the Akimoto Tatsunoko International Scholarship for 2009. All of these students have clear vision of their academic goals while studying in Japan and are working and delivering outstanding academic performance, notwithstanding their grave financial conditions. I am convinced that these students fully qualify and satisfy the objectives of the Foundation. I extend to you my warmest congratulations in joining the Akimoto Tatsunoko Scholarship Program. 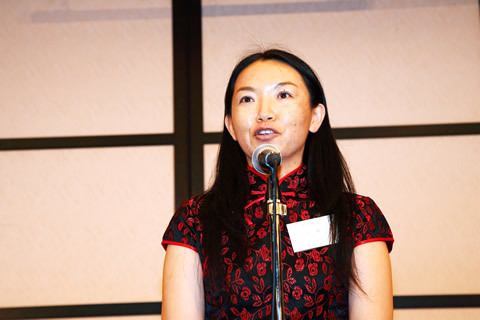 Thank you very much for granting me the opportunity to speak on behalf of the Akimoto Tatsunoko International Scholarship recipients for this year. I came to Japan 6 years ago in the hope of learning Japan's outstanding science and technology and its expertise, as well as new encounters with new people. However, reality had been harsh. With the economic decline that occurred in my home country, the Republic of Korea, 5 years ago, my father had been dismissed from his job and was no longer able to support my studies. I faced an extremely serious financial problem and worried about it every day. I was forced to take on part-time jobs to cover the cost of everyday living and of school studies. At one time, I held 3 part-time jobs and worked without any break while continuing to study. This led to strained both mentally and physically and had me seriously considering abandoning studies. It was under such circumstances that I heard the news that I was selected an Akimoto Tatsunoko International Scholarship recipient. I was overjoyed because I was now able to resume my pursuit of my dream. I would like to thank you all most sincerely. Presently, I am majoring in meteorology, conducting research on "topics related to the geological disasters such as rain storms and floods." My dream is to join the meteorological agency in South Korea and to contribute to the prevention of disasters caused by rain storms in the country, utilizing the knowledge that I have gained through the research. In disaster prevention, I believe that forecasts must be conducted with speed and precision not only for activities in one's home country alone but through cooperation and coordination with various Asian nations. Until now, I had felt that exchange with students from other countries is extremely difficult. I am happy that I have gained the opportunity to meet students from other Asian countries through meetings such as this. In the future, I am hoping to work on development of a disaster prevention and forecast system that covers all of Asia, by building closer ties and helping each other. Lastly, I would like to announce my pledge as a scholarship recipient, representing all of us here, to work to meet the expectations of the members of the Foundation and its contributors in order to serve as a bridge between nations and to contribute to society for the realization of world peace. I would also like to express my sincere gratitude to all of the sponsors and the supporters. A commemorative photo session was held after the award ceremony, together with the officers and screening committee members of the Foundation. I would like to start with my warmest congratulations to the new recipients of the Akimoto Tatsunoko International Scholarship program. Welcome to the Foundation. This foundation not only provides financial assistance but also holds exchanges regularly for the students. Last year, I was able to participate in a Mount Fuji hike, watch a sumo tournament and join in the Tokyo Marathon. Before that, there had been judo practice experience and going to a baseball game. Of course, these exchanges will give you opportunities to deepen understanding and experience Japanese culture on firsthand basis. Not only that, however, it is a prime opportunity to get to know other scholarship recipients as well. In addition to pursuing your studies with the determination and dream that you had when you arrived in Japan for the first time, I would like you to attend actively in these programs and foster friendships with others. 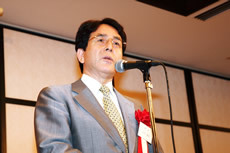 And, when you return to your home countries in the future, I sincerely hope that you keep and build the friendship you gained here, through helping each other and interacting with each other for mutual betterment, in order to make world peace a reality, as Chairman Akimoto had said earlier.